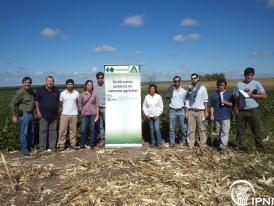 Several regions of Uruguay has recently shown K deficiencies and responses. 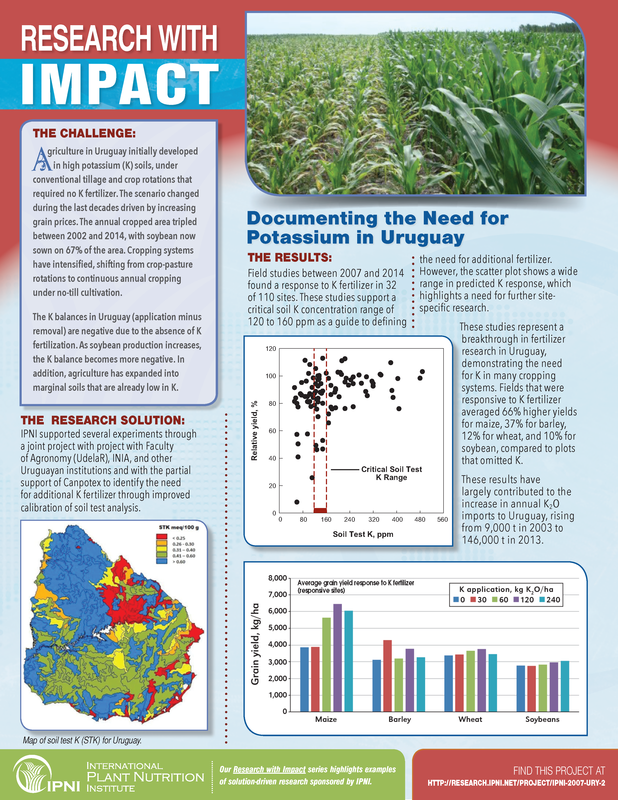 This project looks to determine the different areas with K deficiency, evaluate responses in the main field crops, and provide information on K soil testing. This research is based on previous observations of potassium (K) deficiency and responses to K fertilization in field crops grown within the northwestern Uruguay region. Data from the initial field work, including 50 experiments under wheat, barley, maize, soybean, sunflower, and sorghum, indicated a critical soil K concentration of 0. 30 to 0. 40 cmol/kg i. e. , soil test K (STK) of 117 to 156 ppm . This research is based on previous observations of K deficiency and responses to K fertilization in field crops grown within the northwestern Uruguay region. Data from the first three years of field work and other studies, including 50 experiments under wheat, barley, maize, soybean, sunflower, and sorghum, indicated a critical K concentration of 0. 30 to 0. 40 cmol/kg (i. e. , soil test K STK of 117 to 156 ppm). This research is based on previous observations of K deficiency and responses to K fertilization in field crops grown within the northwestern Uruguay region. Data from the first 3 years of field work and other studies, including 50 experiments under wheat, barley, maize, soybean, sunflower, and sorghum, indicated a critical K concentration of 0. 30 to 0. 40 cmol/kg (i. e. , soil test K STK of 117 to 156 ppm). This research is based on previous observations of K deficiency and responses to K fertilization in field crops grown within the northwestern Uruguay region. Data from the first three years of field work and other studies, including 50 experiments under wheat, barley, maize, soybean, sunflower, and sorghum crops, indicated a critical K concentration of between 0. 30 to 0. 40 cmol/kg (i. e.
This research is based on previous observations of K deficiency and responses in field crops grown within the northwestern Uruguay region. Data from the first three years of field work and other studies, including 50 experiments under wheat, barley, maize, soybean, sunflower, and sorghum crops, indicated a critical K range of 0. 30 to 0. 40 cmol/kg (117 to 156 ppm), below which there is a high probability of response to K fertilization. This research is partly based on previous observations of K deficiency and responses in field crops grown within the northwestern Uruguay region. Data from the first 3 years of field work and other studies, including 50 experiments under wheat, barley, maize, soybean, sunflower, or sorghum, indicated a critical range of 0. 30 to 0. 40 cmol/kg (117 to 156 ppm), below which there is a high probability of response to K fertilization. This research is partly based on previous observations of K deficiency and responses in field crops grown within the northwestern Uruguay region. Field experiments in the first 3 years of this study (2006/07, 2007/08, and 2009/10) have also showed significant responses to K fertilization. This research is partly based on previous observations of K deficiency and responses in field crops grown within the northwestern Uruguay region. Field experiments in the first 2 years of this study (2006/07 and 2007/08) have also showed significant responses to K fertilization. For the 2008/09 season, three field experiments under corn, wheat/soybeans, and barley/soybeans were established at a site with exchangeable soil K of 0. Previous observations have indicated possible K deficiencies and responses in field crops within the northwestern Uruguay region. In the first year of this study during the 2006/07 season, a field experiment also showed a significant response to K fertilization. For the 2007/08 season, three corn experiments were established under different ecological situations within western Uruguay. Previous observations have indicated possible K deficiencies and responses in field crops within the northwestern Uruguay region. In the 2006/07 season, a field experiment was carried out to evaluate K responses in corn. The experiment was located within the Constitucion soil series and available soil K was low (0. 16 cmol/kg exchangeable K) at the site. Documenting the Need for Potassium in Uruguay Agriculture in Uruguay initially developed in high potassium (K) soils, under conventional tillage and crop rotations that required no K fertilizer. The scenario changed during the last decades driven by increasing grain prices. The annual cropped area tripled between 2002 and 2014, with soybean now sown on 67% of the area. Cropping systems have intensified, shifting from crop-pasture rotations to continuous annual cropping under no-till cultivation.